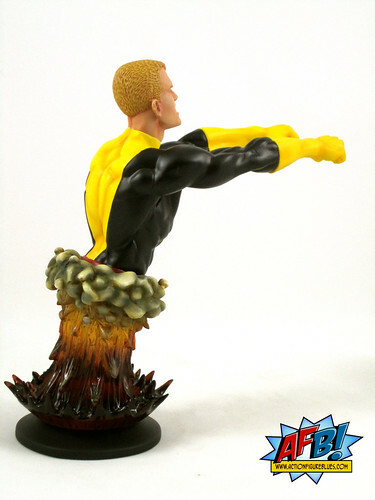 Bowen Designs Cannonball Mini-Bust Blasts Straight to the Top! It’s a dry season for collectors of Bowen Designs Mini-Busts, with a number of factors contributing to a lower than usual number of Mini-Busts seeing the light of day in the last year and a bit. This makes each Mini-Bust that is coming out a treasured gem, and the piece I’m reviewing tonight, the Bowen Designs Cannonball Mini-Bust, is one I’m delighted to have received. 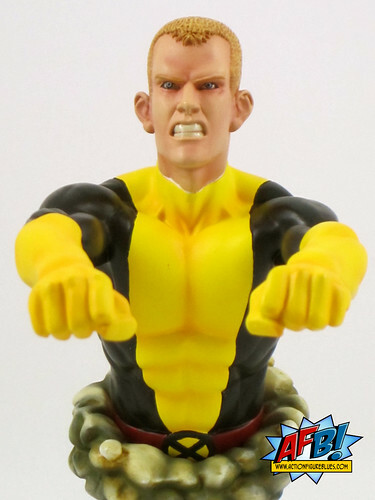 While the X-Men’s New Mutants are very significant characters in the Marvel Universe, they haven’t appeared in a great deal of merchandise over the years. There have been a few releases here and there in various lines, but never anything that could be considered a set. 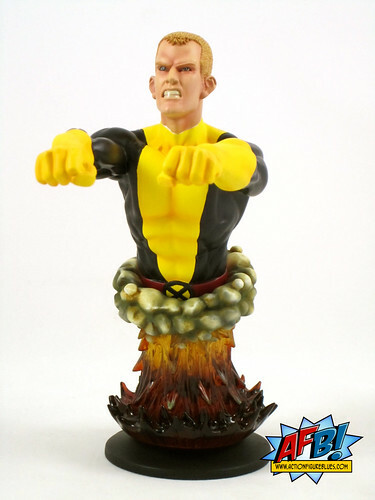 Sam Guthrie, also known as Cannonball, becomes the first New Mutant to appear in the Bowen line in this mini-bust sculpted by regular Bowen sculptor Troy McDevitt. This piece is a great example of very clever sculpting. It manages to adequately depict Cannonball using his power but still puts Sam’s face at an angle that is easy to see from a range of display levels. The arms might have looked a tad better angled a bit further up if you’re looking at it from the side, but from the front it’s very effective. The base of this piece is integral to the design as it reflects the explosive power that gives Cannonball flight. There is a great mix of materials and colours including some transparent elements that add a great deal to the effect. The balance of this piece is impressive - it looks like it could be prone to tipping forward but in fact it stands quite find. I really like the headsculpt of this bust. It captures the hokey, country boy look that Sam had in his early New Mutants days, with his classic crewcut, but gives him a determined facial expression which adds power and energy the overall effect of the piece. I also like that while Cannonball’s teeth are bared the individual teeth aren’t sculpted - an effect that can make a piece like this a little too detailed in my view. The paint work on this piece is relatively solid. There are some very nice details like the tone work on Sam’s hair and his eyes, often a danger point on these pieces, are painted beautifully painted. The lines on the yellow and black elements of his suit are excellent. The only issue here is that there is a small white line between the flesh of Sam’s neck and the yellow edge of his uniform. 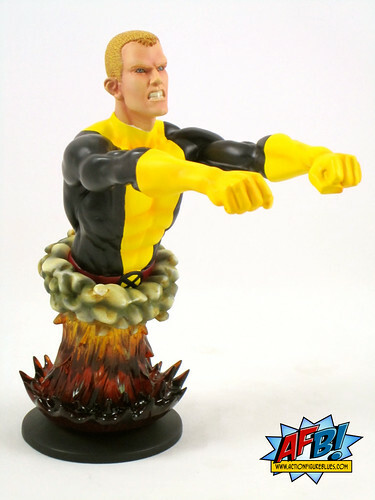 This is a great addition to the Bowen Mini-Bust line up, but I do hope that some of Cannonball’s fellow New Mutants are to follow. It would be great to be able to display all of the original team together! Nicely done! Very simple but works. Grrr... Frankenstein. Fly. Frankenstein. Am. Rocket. Ungh.